Production notes: Scenes 103 and 104 are interior sequences which take place at night. 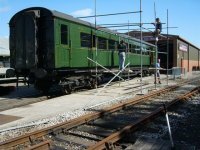 For the production Southern Railway carriage no. 3554 was pulled out of the Museum of Rail Travel at Ingrow. 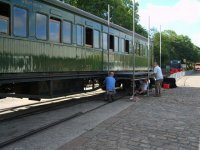 A scaffold tower was constructed around the carriage. 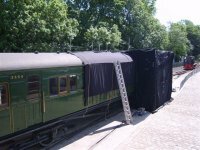 The tower was then covered with black drapes and the camera was located outside the carriage, with the camera lens pointing towards an open carriage window. Summary of the story: Houewife,49 is an adaptation by Victoria Wood of the real-life diary of Nella Last, a housewife from Barrow-in-Furness, Lancashire. Nella began her diary in September 1939 as a volunteer for the Mass Observation Archive. The drama charts the lives of Nella, her family and her friends as the war progresses. Slate numbers: 294 et seq. Filming took place at Keighley station, and featured the characters of Nella List, Cliff Last and Dr. Brierley. To allow uninterrupted filming, normal public services between Keighley station and Ingrow West station were replaced for the duration of the filming by a heritage double-deck bus from the Keighley Bus Museum, Halifax Daimler GJX 331.